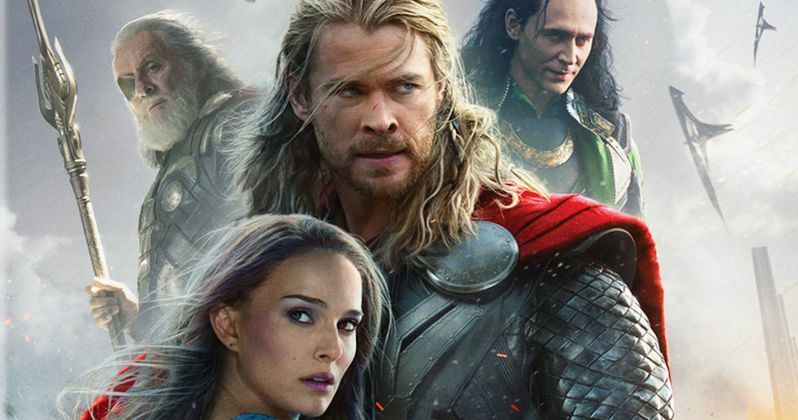 Last month, Marvel Studios released a new trailer for the Blu-ray 3D, Blu-ray and DVD release of Thor: The Dark World on February 25. With the Digital HD version available to purchase starting today, February 4, the studio has released an extended trailer, that offers a sneak peek at the special features. Along with a brief look at the new Marvel One-Shot short film, All Hail The King starring Ben Kingsley, this video offers footage from the Captain America: The Winter Soldier sneak peek, plus a look at behind-the-scenes featurettes with producer Kevin Feige and composer Brian Tyler, along with a gag reel and deleted scenes. Marvel's Thor: The Dark World continues the big screen adventures of Thor, the Mighty Avenger, as he battles to save Earth and all the Nine Realms from a shadowy enemy that predates the universe itself. In the aftermath of Marvel's The Avengers, Thor fights to restore order across the cosmos... but an ancient race led by the vengeful Malekith returns to plunge the universe back into darkness. Faced with an enemy that even Odin and Asgard cannot withstand, Thor must embark on his most perilous and personal journey yet, one that will reunite him with Jane Foster and force him to sacrifice everything to save us all. - Exclusive Look - Marvel's Captain America: The Winter Soldier - Get an exclusive first look at the latest installment in the Captain America franchise and its incredible cast of characters, including Scarlett Johansson as the Black Widow, Samuel L. Jackson as Director Nick Fury, Chris Evans, our hero Steve Rogers, his new ally Sam Wilson, aka the Falcon played by Anthony Mackie, and a mysterious enemy from the past...the Winter Soldier played by Sebastian Stan. - A Brothers' Journey: Thor & Loki - In this 30 min feturette go behind the scenes with filmmakers and cast as we explore two of the most iconic characters in the Marvel Universe with stars Chris Hemsworth (Thor) & Tom Hiddleston (Loki), and journey through the key moments that have defined and endeared these characters to audiences around the world. - Scoring Marvel's Thor: The Dark World with Brian Tyler - Go behind the scenes with the filmmakers and acclaimed composer Brian Tyler for a look at the creation of the movie's stunning original score.